Ataira Franklin scored 20 points to help Virginia oust Boston College, 72-41, last night in the first round of the Atlantic Coast Conference women’s tournament in Greensboro, N.C.
Ariana Moorer also scored 20 points for the sixth-seeded Cavaliers (22-9), who led big all night to give first-year coach Joanne Boyle a win in her tournament debut. Virginia will face No. 6 Maryland in tonight’s quarterfinals. Katie Zenevitch scored 11 points to lead the 11th-seeded Eagles (7-23), who had their worst season since going 6-21 in 1994-95. BC shot 31 percent, including 3 for 19 from 3-point range. Virginia scored 26 points off 23 turnovers. Virginia ran out to 13-3 and 23-9 advantages before leading, 32-16, at the half. The Cavaliers opened the second half with a 15-2 run, with Franklin scoring 10 points, with two 3-pointers. By that point, Franklin had reached 20 points to outscore BC’s entire team and Virginia led, 47-18, with 15:24 left. ACC tournament - At Greensboro, N.C., freshman Brittany Rountree scored 21 points on a tournament-record-tying seven 3-pointers to help North Carolina beat Clemson, 90-51. The fifth-seeded Tar Heels (20-10) led by 49 after halftime and earned their biggest victory margin in an ACC tournament game . 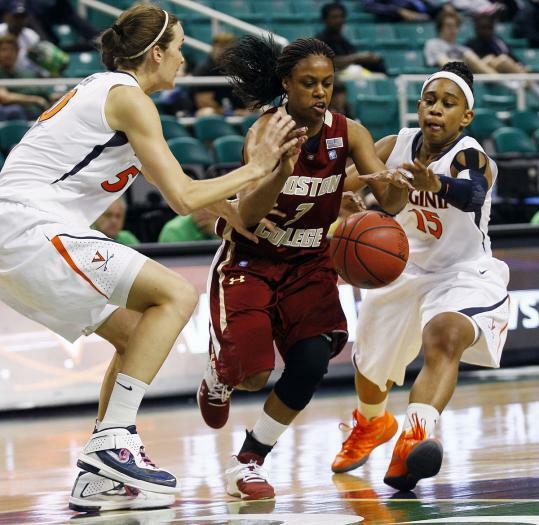 . . Lakevia Boykin scored 22 points to help Wake Forest beat Virginia Tech, 80-74. Chelsea Douglas tied her career high with 21 points for the seventh-seeded Demon Deacons (18-12) . . . Marissa Kastanek scored 21 points to help North Carolina State beat Florida State, 74-71. Emili Tasler hit the go-ahead 3-pointer with 1:23 left for the ninth-seeded Wolfpack (17-14), then Myisha Goodwin-Coleman scored with 43.2 seconds left to put N.C. State up by 3. Alexa Deluzio scored 26 points for the eighth-seeded Seminoles (14-17), who didn’t have a basket in the final 4 1/2 minutes. America East tournament - Samantha Baranowski’s 16 points led Maine to its first tournament win since 2006 in a 49-43 victory over the ninth-seeded Seawolves in the opening round in West Hartford. Eighth-seeded Maine will play top-seeded Boston University today at noon. Patriot League tournament - Sophomore Christine Ganser came off the bench to score a team-high 17 points, hitting all six of her shots from the field, and Holy Cross advanced to the semifinals with a 59-50 win over Army at West Point, N.Y. Holy Cross (17-13) will travel to top-seeded American University Monday. Ganser made a key basket with 1:48 left to extend the Crusaders’ lead to 55-49. Northeast-10 tournament - Caleigh Crowell made a 3-pointer with seven seconds left in regulation to tie it, another in the second overtime to key a 7-0 run, and Bentley outlasted Franklin Pierce, 69-65, in the semifinals at Waltham. The Falcons (26-3), ranked sixth in Division 2, shot just 26 percent from the floor, and were led by Lauren Battista and Courtney Finn (18 points apiece). The Ravens (19-9) got a tying triple of their own with 23 seconds left in the first overtime from Tiffany Johnson . . . In New Haven, Moni Smith-Ocran’s layup with 24 seconds left pushed second-seeded Southern Connecticut State past third-seeded Pace, 48-47, and into the championship game. Green Bay 85, Loyola (Ill.) 56 - Julie Wojta scored 24 points, and the 11th-ranked Phoenix (26-1, 16-1 Horizon) pulled past the host Ramblers. Kentucky 79, Georgia 49- Darius Miller hit five 3-pointers and finished with 17 points, and the No. 1 Wildcats (29-1, 15-0 SEC) beat the Bulldogs (12-16, 4-11) to extend the nation’s longest home winning streak to 52 games and push its overall run to 21 in a row. Michigan 72, Illinois 61 - Tim Hardaway Jr. had 25 points to help keep the No. 13 Wolverines (22-8, 12-5) in the Big Ten title race with a win over the host Illini (17-13, 6-11). Michigan can claim a share of the conference title with a win Sunday over Penn State and an Ohio State win over Michigan State. Florida St. 63, Virginia 60 - Ian Miller made a 3-pointer with 0.8 seconds left and the No. 22 Seminoles (20-9, 11-4 ACC) rallied from 11 points down in last 4 1/2 minutes to stun the 24th-ranked Cavaliers (21-8, 8-7) in Charlottesville, Va.
Miller scored 15 of his 18 points in the second half, and got just free enough from Sammy Zeglinski in the final seconds to make the shot from deep in the right wing. It was Miller’s fifth 3-pointer and the seventh for the Seminoles. America East tournament - Ben Dickinson scored 21 points and pulled down a team-high nine rebounds as Binghamton (2-28) beat Maryland-Baltimore County, 73-67, in overtime of the first round in West Hartford. NEC quarterfinals - In New York, Kenneth Ortiz led five Wagner players in double figures with 16 points and the second-seeded Seahawks (25-5) defeated Central Connecticut State, 87-77. Ken Horton paced the seventh-seeded Blue Devils (13-16) with 25 points . . . Jamal Olasewere had 20 points and seven rebounds as top-seeded Long Island (23-8) beat Sacred Heart, 80-68, in New York. Shane Gibson led Sacred Heart (14-18) with 22 points . . . James Johnson scored 22 points and Ike Azotam posted a double-double (15 points, 12 rebounds) as Quinnipiac (18-12) defeated St. Francis (N.Y.), 80-72 . . . Coron Williams scored 25 points, hitting eight 3-pointers, as Robert Morris defeated Monmouth, 87-68. The third-seeded Colonials (23-9), who are seeking a league-record eighth tournament championship, made 16 3-pointers, tying the 2008 school record.